EUGENE (YEVGENY) LANCERAY IS ONE OF THE FEW RUSSIAN ARTISTS WHO NOT ONLY EXPERIENCED BUT ALSO CAPTURED IN HIS WORK MANY EVENTS OF BOTH THE FIRST AND SECOND WORLD WARS. IN THE WINTER OF 1914-1915 HE TRAVELLED TO THE TURKISH FRONT TO PAINT LOCAL PEOPLE, COSSACKS AND EVENTS ON THE BATTLEFIELD1. THAT WAR WAS CALLED THE T,REAT PATRIOTIC WAR", AND IT WAS FOLLOWED BY THE BOLSHEVIK REVOLUTION IN 1917 AND THE CIVIL WAR. BUT FEW COULD HAVE FORESEEN THAT A NEW WORLD WAR WOULD BREAK OUT SO SOON. ON SEPTEMBER 4 1939 THE ARTIST WROTE IN HIS DIARY2: "A SECOND WORLD WAR! AGAIN EVERYTHING IS FALLING APART! BUT INERTIA STILL RULES WHILE BOTH I AND EVERYBODY ELSE TALKS AND CARES ABOUT THE SUBTLETIES OF PROPORTIONS AND SHADES OF COLOURS!.. I'M THINKING ABOUT THE PARISIANS AND KOLYA3." ON SEPTEMBER 9: "OLYOK4 IS FEELING LOW BECAUSE WAR IS LOOMING. PEOPLE SEEM TO BE BUYING UP FOOD. QUEUES EVERYWHERE. HUGE CROWDS IN THE SAVINGS BANKS." ON SEPTEMBER 24: "HISTORICAL EVENTS ARE FOLLOWING EACH OTHER IN A FLASH: THE 17TH - SOVIET TROOPS ENTER POLAND. POLAND'S ULTIMATE DEBACLE, AND YESTERDAY - ITS PARTITION; EVERYONE IS SPECULATING WHO WILL GET HOLD OF WARSAW, WHICH STRADDLES THE DIVIDE." BUT THE WAR WOULD ONLY REACH RUSSIA IN JUNE 1941. During the pre-war years Lanceray was busy and much in demand as an artist. He designed the picture book "Alexander Golovin’s Designs for the Sets of Lermontov’s ’Masquerade’” (Moscow-Leningrad, 1941), Alexei Lebedev’s monograph on Fyodor Rokotov (Moscow, 1941) and Mikhail Nesterov’s memoir "Long Bygone Days” (Moscow, 1941), and all these works were published. However, for different reasons, many of the mural projects which he undertook were never realized: these include sketches for panels for the main hall and plafonds over the staircase in the Lenin State Library of the USSR (1935-40), sketches of the inlaid frieze for the hall of arts at the New York World Fair (designs made in 1938), paintings for the plafond in the Bolshoi Theatre’s auditorium (1940; the committee for Arts shelved the project in April 1941). The committee members often mentioned a lack of a "profound socialist” idea, which was fair since Lanceray was inclined to use universal symbols and allegories. Moreover, the compositions, distinguished by their neat moulding rather than decorative spots, seemed outdated to many. Many projects, such as the design of the interior of the Big Hall of the palace of Soviets (1938-41) and theatre work, were cancelled because of pre-war and wartime hardships. In August 1942 the Khudfond (Artistic Foundation) publisher refused for political reasons to print a book about Svaneti with Lanceray’s illustrations. On June 13 1941, Lanceray brought to the Stanislavsky Theatre his final sketches and models of the sets for Sergei prokofiev’s opera"Betrothal in a Monastery”, but the project was not realized on account of the war5. And just two days before the outbreak of war on June 20 1941 the Railways management approved sketches for two panels which were to grace the interior of the Kazan Station ("The Storming of the Winter Palace" and "Celebration on Red Square on the Occasion of the Adoption of the Soviet Constitution in 1936"). The implementation of these projects was suspended when the war began, and by in 1943 the artist had abandoned them altogether. When war broke, Lanceray was in Moscow, working on the sketches for the Kazan Station murals6. "Now there's a war... At about one o'clock Ida Fedorovna called to say - we're at war, shelling in Kiev, Kishinev, Kaunas, Sevastopol, Zhyto- myr. It was hard to believe," he wrote on the evening of June 22. On June 27-28 the artist worked on a commission evaluating student graduation works and conducted an examination at the Academy of Architecture7. It was only after that that he went to his family at their summer house in the village of Peski near Kolomna. The home had been built in 1939-40, with Lanceray's son Yevgeny producing technical drawings for it. In the summer of 1941 the Lancerays wanted to add new structures to the house but the war interfered with their plans. Despite shelling and proposals for evacuation8, by the end of August the family had decided to remain. During the heaviest rounds of bombardment in October-November 1941 their neighbours suggested that they "hide away in the woods". Rumours only fuelled existing fears. On October 18 Lanceray wrote: "Rumours are very vague; clearly, there is huge panic in Moscow; the trains - the wagons with escapees… Rumours about the taking of Kashira. But we don't believe [them]." Early in November, when there were fears of the Germans advancing from Kashira, trenches were dug on the fringes of the forest. But already in December, as the Germans began to retreat, Lanceray resumed his artistic projects. On December 5 his son Zhenya took sketches for the opera "Suvorov" to Moscow. But the artist's health was deteriorating and on December 28 he visited a doctor in Moscow, who "gave me a general health check - diagnosed weight loss, exhaustion - hence my hernia". However, the arrival of the New Year, 1942, was celebrated at the summer house, and in a good mood: "a fir tree, chandeliers with candles; very warm, in spite of the biting frost. The Kolobovs, Kuprin, 'the Amirovs', and me with Tanya = 8." In Peski, Lanceray lived with his wife and her niece Tatiana Artsebusheva; his son Yevgeny, and his daughter Natalya, who had to work on a collective farm in exchange for bread and potatoes; and Natalya's husband, the architect Georgy Voloshinov, and their children, Andrei and Maria. 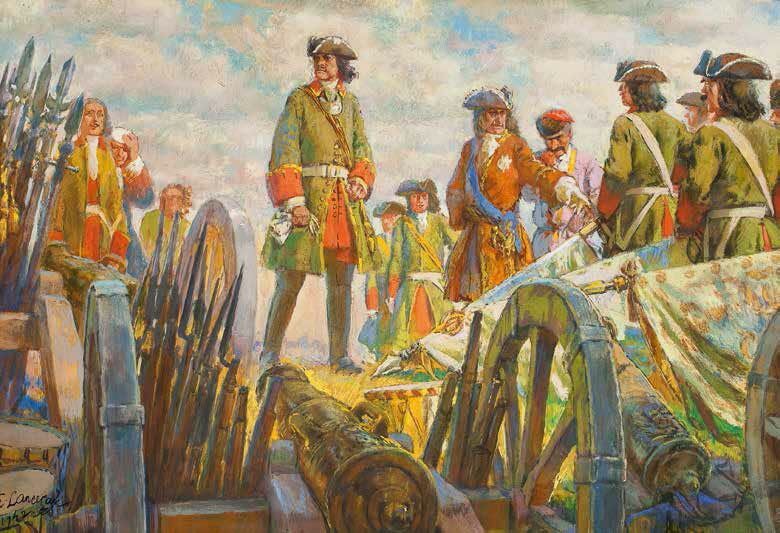 In order to get food, they had to ride or walk on foot 12 kilometres to Kolomna, where they sold their belongings or exchanged them for food. On February 24 1942, "Olyok exchanged her small gold watch for 2 poods [about 33 kilograms] of black [rye] flour and a bag of potatoes." The family kept nanny goats, and in 1943 managed to buy a cow and to obtain bees. In a letter, dated February 15 1944, to Veniamin and Vladimir Belkins in recently liberated Leningrad, Lanceray recounted the events of 1941-1943: "We all spent the first wartime autumn and the early winter at the summer house, and it was an awful time: we dug trenches in front of our summer house, heaped up earth to form banks, the station was bombed - about one kilometre away from the summer house; cattle were driven past us, with people fleeing, the roar of guns getting nearer; and yet, the Germans stopped 40-50 kilometres from us and were pushed back, while we managed to stay on there and thus we preserved our summer house and possessions. Sure enough, the time was difficult both in terms of food and money... but it is still incomparable to what you have suffered." The name of their settlement was "Soviet Artist" and their contacts with other residents, including Alexander Kuprin, Pyotr Konchalovsky, Yury Pimenov, the Fedorovs, the Kolobovs, the Fomins and others, were of much help. At the same time, his stay at the summer house encouraged the artist to paint pictures: he created a self-portrait (1942), views of Peski, the triptych "Lake Goygol" (1943-44)9, and still-lifes ("Pumpkins", 1943; "Hunter's Still-life", 1944), in which he developed the principles of realist art. The artist's interest in war-related themes grew steadily from 1942, as he had to spend increasingly more time in Moscow working on commissioned graphic pieces. From January to March he was designing the cover for the album "Moscow Artists' Paintings for the Army" and working on the publisher's lay-out of the book "The Great Patriotic War", followed a little later by the auto-lithograph "On Patrol". On January 29 1942, Lanceray wrote: "I want so much to paint from nature (on the battlefields)." He did not end up there, but equally he did not want to go into the country's heartland, far from the front lines, either. When the news came about the deaths in besieged Leningrad10, the offers of evacuation became more frequent: Alexander Gerasimov, Sergei Merkurov and Boris lo- fan proposed to move to Sverdlovsk11. Lanceray was keen on accuracy in tackling the small details in his works. When he painted "The Routing of a German Artillery Unit" in February 1942, he came to the House of the Red Army to see German guns. In June, preparing the composition (never finished) "A Concert in a Hospital", he sketched the People's Artists of the USSR Nadezhda Obukhova and Yelena Stepanova as they sang at a soldiers' hospital on Khavsko-Shabolovsky lane in Moscow, On September 21-25 he explored the damage to the town of Istra together with his son and Alexei Shchusev. Later, in 1944, he created the cover, frontispiece, headpieces and endpieces for Shchusev's book "Project for the Restoration of the Town of Istra" (Moscow, 1946). 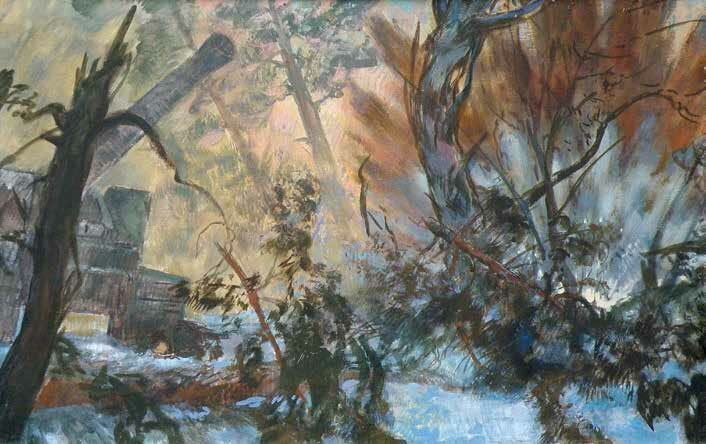 Meanwhile, before Easter in April 1942, Lanceray set about working on his last series of paintings "Russian War Trophies", commissioned by Khudfond and consisting of five historical compositions: "After the Battle of Lake Peipus" ("After the Battle on the Ice"), "Soldiers with Trophy Guns" ("Near Moscow, 1941"), "Evening after Borodino" ("Evening after the Battle of Borodino"), "On Kulikovo Field", "Peter I After Poltava" ("The Poltava Victory"). 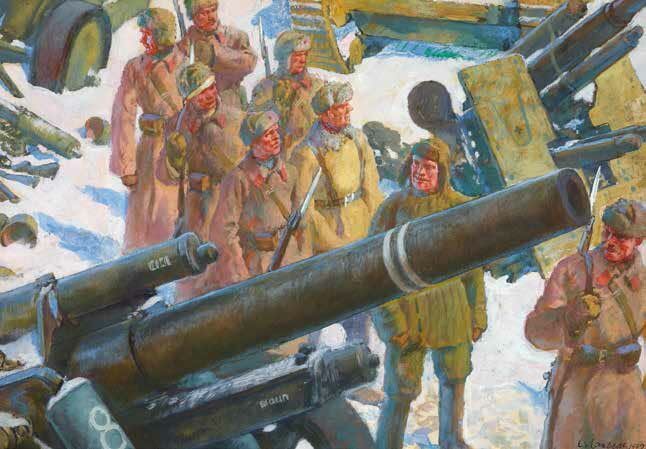 Completed by October, the series was put on display at the "Great Patriotic War" exhibition at the Tretyakov Gallery12 on November 7 1942, where it replaced the Gallery's artworks that had been evacuated. On March 19 1943 the artist was awarded the USSR State Prize of the 2nd Degree for this series. He wrote in his autobiography: "When I received the Stalin Prize, my thinking and mindset changed - now I had self-confidence and hopes for the future. "13 When the exhibition closed at the end of 1943, the Tretyakov Gallery kept the series. Lanceray was always a keen student of history, and this attitude strongly marked his art. In February 1943 he met with the historians Yevgeny Tarle and AlexeyYakovlev, who argued that the battle of Stalingrad was a turning point in the war and compared it with the Battle of Tours in 732. 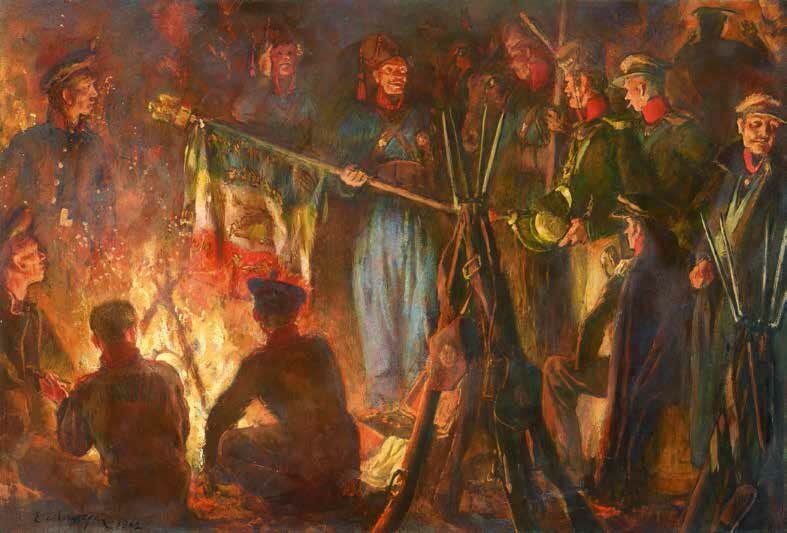 Within a day of the capitulation of the Third Reich's 6th Army Lanceray approached the Committee for Arts under the aegis of the Council of People's Commissars of the USSR with the proposal to paint a triptych "War and Peace". He prepared drafts for only two sections of the composition ("Mobilisation" and "An Artillery Battle in a Forest"). The right-hand section, which was difficult to tackle during the war, remained only in the form of sketches, like the entire triptych. 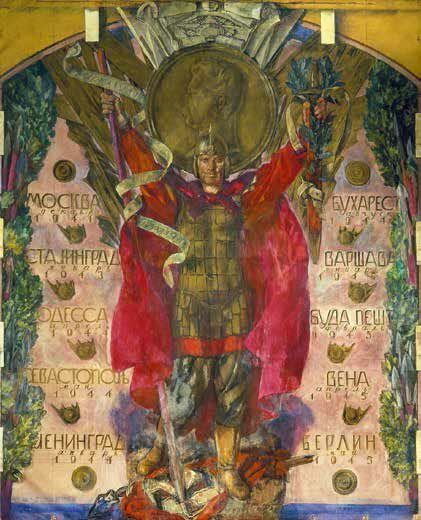 But the subject of the right section of the composition - "Peace" - would be used in a mural, after Lanceray received a letter from the Kazan Station chief A. Popov on February 7 1945 demanding that he should produce, by November, two panels for the station's Soyembika Tower, which had been commissioned back in 1939. "Since lunch I've been grinding out a replacement for the previous sketches. And now, when it's 11 p.m., I think I've got an idea. I'm taking the figures of Peace and Victory from the sketch in the works; it seems that they'll yield what I've long been dreaming about," the artist wrote that same day. The murals were created only in 1946. 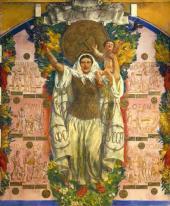 Completed in May 1946, "Peace" features a woman in a cloak holding a child and a laurel branch; the mural "Victory", work on which was begun only on August 3 and which was finished by the academician's son after his death, should have featured Athena according to the initial idea, but in May 1945 the sketches for the piece already featured a warrior in chainmail, a helmet and cloak, with a sword and a spear (but, contrary to the request, without a rifle). 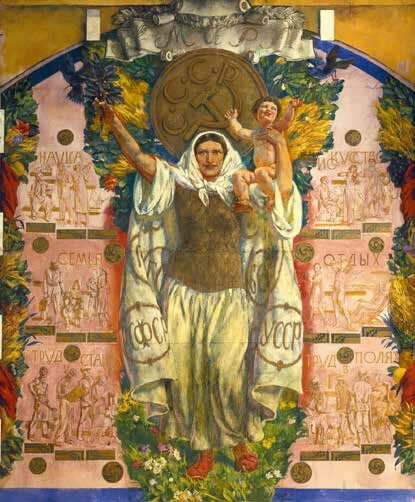 The woman in "Peace" is surrounded by monochrome compositions on themes of peaceful life ("Science","Art", "Family", "Leisure", "Working at a Machine-tool", "Working in the Field"), while the warrior is flanked by the names of ten cities where the Soviet army had won battles, each name inscribed in golden letters. In a letter to Iosif Charlemagne of November 7 1945, the artist wrote: "[I was] anxious that my treatment of the subjects would put them off - and they would say, 'look, this is the Mother of God with the infant Jesus and St. George with the lance' - but everything went smoothly." Before victory came, Lanceray spent two years working busily on a variety of creative projects. 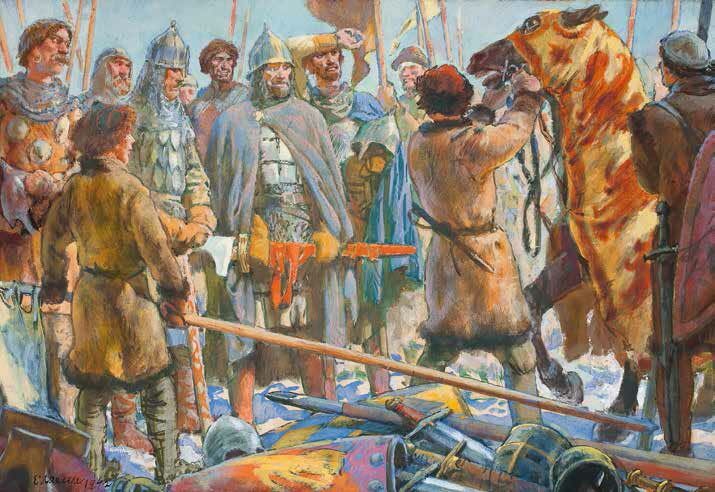 On May 10 1943 the Tretyakov Gallery opened an exhibition showcasing seven artists of the older generation which, together with Lanceray, featured Vasily Baksheev, Vitold Byalynitsky-Birulya, Igor Grabar, Vasily Meshkov, Ivan Pavlov and Konstantin Yuon. On July 15 all the artists except Igor Grabar were awarded the Order of the Red Banner of Labour. This was the last major exhibition to feature Lanceray's art during his lifetime: the catalogue printed in autumn 1944 lists more than 100 paintings, drawings, sketches for murals, and stage sets that he had produced since 1907, but only seven works created during the war (1941-42). Nevertheless, it would be wrong to see this exhibition as the final event of the artist's career. 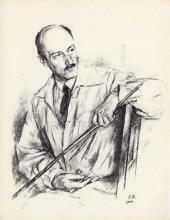 Lanceray's experience was very important in different spheres of the life of art: in November-December 1943 he was sent by the Committee for Arts and the Russian National Theatre Society to Tbilisi to study the art of local artists, engage in consultations about artistic education, and offer to establish an applied arts department at the Tbilisi Academy of Arts. Lanceray's talent for mural painting would prove useful too: on March 7 1944, at the Moscow Society of Soviet Artists, he delivered a lecture "My Work as a Muralist", and on April 19 1945 "Soviet Art" newspaper ran his article "On Mural Painting". Since 1943 the artist had been working on the reconstruction of the Vakhtangov Theatre, which had been damaged by a bomb in 1941; in 1944, accepting the architect Dmitry Chechulin's offer, he created the design for the painted ceiling in the lobby and the central plafond of the Mossovet Theatre (neither project was realized). The broad range of his talent is evidenced by the consultations he provided about designing metro stations (metro station "ZIS") and new military awards (including for women), about a new production of Griboyedov's "Woe from Wit" at the Maly Theatre, and by his attendance of meetings where labels for the food industry giant "Pishcheprom" were discussed. Recognition of Lanceray's contribution to the development of different areas of Russian culture culminated in the decision to award the 69-year-old artist, on February 26 1945, the title of the People's Artist of the RSFSR (Russian Soviet Federative Socialist Republic), and on September 4 1945, a second Order of the Red Banner of Labour. After the end of the war, on May 18 1945, Lanceray wrote to his sister in Paris about the demise of their brother Nikolai, who had died in 1942, but ended the letter with a note of hope: "Now, when this awful war has ended with victory, we all believe that we shall establish contacts with all of you, who are so far away and so near, and maybe we'll see each other." They were never to meet. Much earlier, on November 19 1942, Lanceray had written: "What everyone wants to know is whether there will be changes after the war; most [think] that no, if we win, the situation is going to get worse. I am usually the only one to hope for evolution, and that things may get a little easier." See Pavlinov, P. 'Eugene Lanceray on the Caucasian Front. His Drawings and Notes' // "Sobranie" (Collection). 2005. No. 2. Pp. 16-23. Hereinafter referred to as the Lanceray family archive. Eugene Lanceray's sister Zinaida Serebryakova moved to Paris in 1924. Her children Alexander and Yekaterina joined her there in 1925 and 1928, respectively. During the war they stayed in Paris. Eugene Lanceray's brother, the architect Nikolai Lanceray, was arrested for a second time on espionage charges in 1938. Eugene wrote letters to Zhdanov, Kaganovich and state prosecutors, but Nikolai was sentenced to five years in the labour camps. On July 18 1939, without being granted a meeting with his family, Nikolai was sent to Kotlas, and in the autumn of the same year to Kochmes, a village in the Ust-Usinsky Region of the Republic of Komi. In August 1940 he was sent to a prison in Moscow, and in summer 1941 to a prison in Saratov, where he died in May 1942. Lanceray's wife - Olga Konstantinovna (nee Artsubysheva). Eugene Lanceray worked on sketches for "Betrothal in a Monastery" together with his son Yevgeny (1907-1988), a painter, architect and book illustrator. Two theatre projects also remained unrealized: sketches for the Maly Theatre's production of Friedrich Schiller's "Intrigue and Love", which the artist accomplished in 1941, and sketches for the sets of Sergei Vasilenko's opera "Suvorov" at the Stanislavsky Theatre, on which the artist worked in 1941-1943. To learn more about Lanceray's life and art in July-December 1941, see V. Byalik's article 'Witness of the War' // "Russkoe Iskusstvo" (Russian Art). Moscow: 2005. No. 4. Pp. 136-139. Soon the Academy of Architecture would be evacuated to Shymkent, and Lanceray, who had been teaching there continuously since 1922, would give up his mentoring work. Evacuation by train to Nalchik was offered on August 8 1941. Those who availed themselves of the opportunity included Igor Grabar, Victor Vesnin, Mikhail Yakovlev and many others. The triptych "Lake Goygol" was exhibited at a show of landscape paintings organised by the Moscow Union of Soviet Artists on the premises of the Moscow Partnership of Artists. From a diary entry dated February 15 1942: "Awful news from St. Petersburg - famine. The ruination of Peterhof, Tsarskoe Selo, Oranienbaum, Gatchina." On March 2: "Awful news: the deaths of Vladimir Frolov, Ivan Bilibin, Petrov, Naumov, Karev... 47 artists in all, they say." Entries made later, too, are hard to read without wincing. On April 16 1944: "The Frolovs are visiting us; Andrei talks about Leningrad. The Zarudny sisters losing food stamps in February 1942, their death from hunger." Lanceray's niece Tatiana Serebryakova and her husband Valentin Nikolaev left for Sverdlovsk in January 1942. Tatiana's brother Yevgeny Serebryakov lived with his wife in evacuation in Frunze until summer 1945. The show featured 255 artists. The pieces on view included Arkady Plastov's "A Nazi Plane Has Flown Over" and Pavel Korin's triptych "Alexander Nevsky". Lanceray, Eugene. 'An Autobiographical Essay' // Vasily Baksheev, Vitold Byalynitsky-Birulya, Igor Grabar, Eugene Lanceray, Vasily Meshkov, Ivan Pavlov, Konstantin Yuon. (Catalogue of the exhibition). Moscow: 1944. P. 46.